Oftentimes I find animals that push the limits are the ones that really capture my attention. Who isn’t impressed by a majestic elephant or blue whale? Or animals that have big horns, or frightening claws, or massive teeth? But there’s another side to animal biology, and it seems like it’s one that’s often ignored, at least by me. There are some animals that are so small it seems like they shouldn’t survive at all. And really, you can’t blame me for not writing about them often, I simply missed them because they’re so small (that was a good joke, and you know it!). The Barbados threadsnake is currently recognized as the smallest snake in the world. The largest specimen ever found was only 10.4 cm long. As the name suggests, they are found in Barbados, in forested areas. The species was discovered in 2008, under some rocks in the forest. 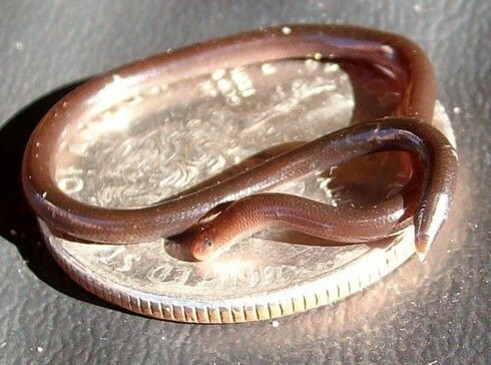 A threadsnake with a quarter for comparison. Pretty small, right? Barbados threadsnakes are members of the genus Leptotyphlops, which contains a number of tiny snakes. All snakes in Leptotyphlops are blind, and spend most of their time underground, only coming to the surface when rain floods their burrows and they have to leave. So basically they act like worms. Though I wouldn’t call them that – I’m pretty sure it’s an insult to snakes. You might wonder what such tiny creatures eat, and the answer is tiny things. Barbados threadsnakes eat termites and ant larvae, and not much else. That’s pretty much all we know about the feeding behaviour of this species, and considering it was only discovered 5 years ago, I’m not surprised. These guys aren’t venomous though, so presumably they just gobble up harmless larvae by the thimbleful. 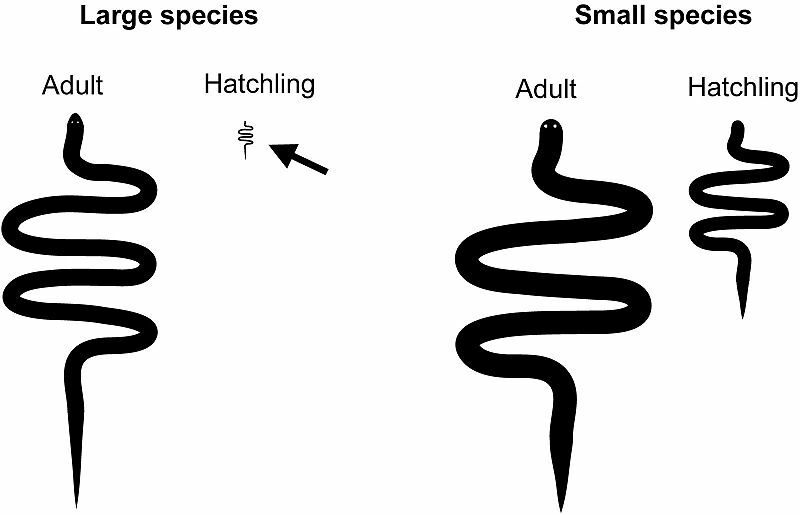 A size comparison of the offspring of large snake species, and small ones. I think the Barbados threadsnake would fit into the ‘small’ category. These snakes are also so small that they only lay one (relatively huge) egg. This lets the baby snake be as large as possible, suggesting that there is a minimum size that young snakes need to be to survive. Indeed, Barbados threadsnake’s young are much larger compared to their parents than in larger species of snakes. So it seems that being really small, just like being really big, requires some special adaptations. Plus, I feel like it would be a lot scarier… after all, everything in the world would look huge! So good for you, Barbados threadsnake. This species was discovered many years ago, not in 2008…. Locals knew about this snake since at least the 1980’s, and probably before then. That is true, but it was only identified as its own species in 2008. I admit my wording could have been clearer, thanks for pointing that out! Is it possible to buy one? If yes, how expensive are they? Hi Valentin, I am not sure if you can buy these guys, I personally do not keep reptiles or amphibians as pets. If you do end up buying one, please try and source from captive bred populations, not wild caught!